Customers from outside of the United States will appreciate the March Pump - Polysulfone 230V, an updated version of our H315 with a 230V motor for customers from Europe, Australia, New Zealand and other foreign countries. 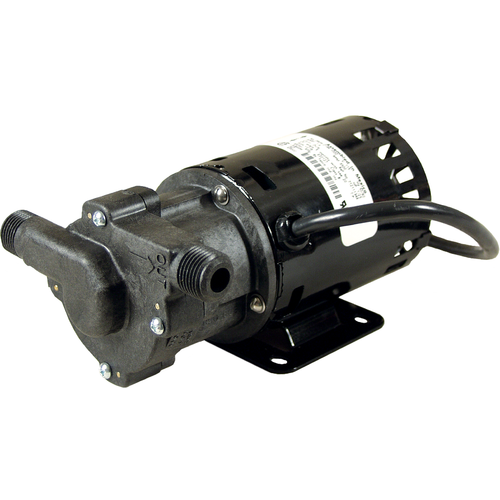 This pump contains the same polysulfone pump housing as the H315, and it comes with a 3-foot cord to which customers can wire an appropriate plug. This March Pump is a great addition to your home brewing setup because it cuts down on the amount of heavy lifting that you’ll have to do with your hot wort, water and other liquids. The March Pump - Polysulfone 230V is also very easy to clean by simply disassembling its pieces when necessary. Definitely cuts down on lifting/lugging large amounts of (normally hot) water/wort/etc. This pump is pretty tough. I have dry-run the pump multiple times and it keeps on kicking! It does tend to plug with excessive amounts of hop material in the kettle, especially with whole hops. However, it is very easy to disassemble and clean if needed. I normally just CIP with PBW and hot water after brewday is over. Great pump but can have problems priming without a bleed valve. Great pump, really good flow rate and can pump up pretty high when there isn't much restriction on the intake side - so place the pump near where you are going to pump from with a short hose if possible or even directly on the tank for the best flow rate if you really need to push it. The only downsides are that the o-ring inside is very thin and will expand and not fit anymore if you take it apart a few times to inspect/clean, and this pump can have problems priming so it's best to have a bleed valve on the pump-out side - aim it downwards from the pump port to make it easy for liquid to just drain downwards and not have to travel up and over anything, then your pump will prime when you just open the bleed valve. Makes it easy to take a test sample too!